That's me . . . it's just too cold to do anything outdoors, so I'm posting some other wildlife for the reader . . . these are pictures submitted by readers of our local skinny newspaper. I hope you enjoy them. . . many are taken right within Anchorage, as the winter brings out more wildlife into the city . . .to get food from our garbage and backpack. 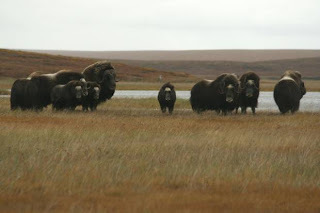 These muskox were photographed by Ken Stenak in Shishmaref... isn't that a neat name! 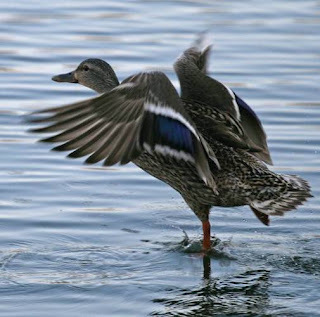 How about this shot of a mallard hen at Taku Lake, taken by Danny Anctil. 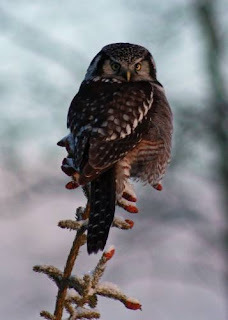 Kinkaid Park is just south of ANC (airport code) and there sits a snowy owl taken by Scott Kendall. Homer is on the Kenai Peninsula, sometimes called the End of the Road. 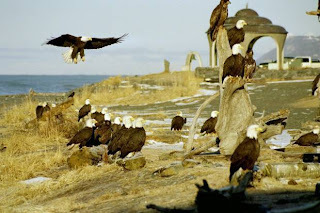 The woman who used to feed the eagles died, and it's no longer allowed to feed them. 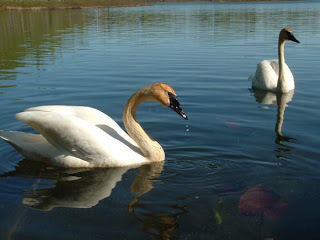 Corrine Johnson took this shot of the Wild Birds at Birch Lake - also near Anchorage. That doesn't mean there isn't a lot going on in Anchorage, too. Come visit us as we share our wonderful environment. Christmas is as good a time as any. Our homes are beautifully decorated, and caroling is everywhere, too. It's too cold to venture outside ... global cooling . . . so getting rid of some images here .. this first one is a watercolor of Gail Niebrugge, an artist friend of mine. Next,we have a human replica of the Statue of Liberty. 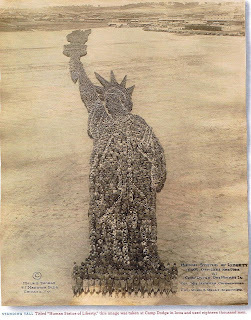 Unfortunately, this is too small to see that this is made of actual live people, standing in this formation. . . it would be too difficult to postwith enough pixels, but you can try to enlarge it, to see what I mean. 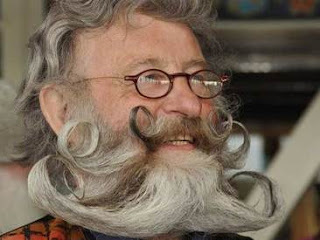 and here's a magician to advertise our upcoming Magic Show - December 26 -29th . . . a flyer will be appearing on our Alaska Magic Circle page, when I get a minute to post it. 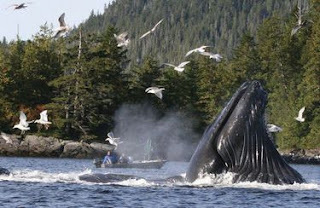 Like I say, come visit Alaska! I couldn't resist copying this beautiful shot by Bill Roth, as I sit indoors and stay warm. It's just kind of chilly out there, or as the weather man puts it . . . in the 'single digits'. 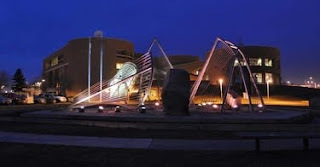 This is a shot of our beautiful fountain at the library. Of course, no water flows inthe winter because it's ice, but the colored spotlight on the structure is quite beautful. In the summer, the fountain does sprew water, but remember, we have daylight all the time, so it's hard to see the colors. 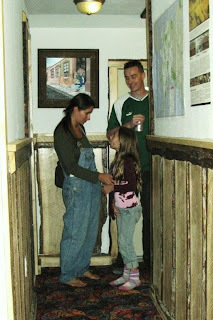 The gal who spearheadd this project, thru "Friends of the Library" is gone now, but her daughter is the spitting image of her, in looks and personality, and I enjoy her friendship, as she's active in all walks of life, and unlke her mother, we share political beliefs. But this is a travel blog, so I won't elaborate on that one. You'd think that after 43 winters here, one would get used to the winter chills. Wrong ... it doesn't happen. There is a plus side to this, tho'.. . . hmmm, let me think. Well, when the snow falls, everything looks so clean and bright and white! It's wise to park your car in a covered area, as 6" of snow on the roof is really heavy to shovel off, and I empathize with my neighbors with driveways to clear. It's just the advantage of living in a condo. As darkness falls before 4 p.m. now, activities increase and you'll find a wealth of bazaars, plays, concerts, symphony, x-c skiing, ice hockey, figure skating, indoor tennis, Sunday football and other events. With Christmas around the corner, we have several parties for the young ones, and of course, office parties for the not-young ones, who think they are. The Pioneers of Alaska - Women's Igloo #4 - has a big one with 85 kids coming. I know the number because we wrapped that many present for them. The Petroleum Club, likewise, has a heap of children for their party, too, and the committee does a super job of picking presents to match the guests. You really would enjoy seeing our winter, as well as the tourist-crowded summer, as we have a lot to do, or do NOTHING AT ALL! Well, I hope you missed my blog over the last few weeks. I could have posted from the Boston Library, where I was getting my email, but an hour was hardly time to sort thru the daily things. Okay, I should have carried my laptop, but no . . . it's nice to visit a big city, but nicer to get back to Alaska. People comment that the cost of getting here is just too much, but it won't be any less next year, I guarantee, so you should plan your visit now. Why come to Anchorage? First, our weather is as good or better than Boston. It doesn't rain all day, ever. The traffic is never more than a two red light wait, and drivers are polite. Usually, they are! Unfortunately, the highway engineers have been tampering with a satisfactory highway network, by forcing in roundabouts, and making some 4 lane major arteries 3 lanes. They say it improves the flow, but this is only because many avoid those roads now, causing less traffic. There was a successful campaign by the businesses on Fireweed Lane (a major east-west mid-town street) to keep these city planners out of the area. Now, comparing museums, I have to admit the Museum of Fine Arts in Boston is quite fabulous, and the $20 admission is acceptable, but there is a limited amount of time and energy to visit all the galleries in one visit. The Anchorage Museum of Fine Arts is also great, altho' quite a bit smaller, but adequate, and the $7 admission is more reasonable. Restaurants abound in both cities, but overall, the prices in Boston are much higher. Anchorage boasts umpteen Mexican restaurants, and I didn't see any in Boston. The fast-food chains are in both places, and sidewalk cafes are inviting. Starbucks are found on most corners, it seemed, and shops between Copley Square and Arlington/Boston Commons are quite fancy. But Boston has no Nordstroms. How can that be! 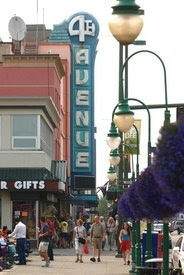 Anchorage has a downtown core with Nordie's and J.C. Penney's being the two major stores, and free parking at Penney's garage. Forget about parking in Boston -- it can be done if you want to pay $12/hr. Well, I don't. Public transportation in Boston is pretty special. You can even take a subway to the airport (a shuttle takes you the last part right to your terminal) which is truly easier than turning in a rental car, or getting a lift there thru a toll-gate. Logan Airport is huge, and they've upgraded many restaurants and shops since 9-11, I understand. However, Anchorage has upgraded their airport, too, and it's easy/free access. . .but there's no public transportation to get there. There are many educational colleges there. Northeastern Univ. just dropped their football program, but there's Harvard right across the River and many smaller colleges. On the music scene, you have Berklee School of Music, New England Conservatory, and other smaller schools. In Anchorage, you have ME! 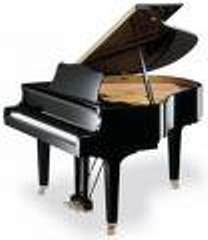 Yes, I teach piano, but we have the University of Alaska, Anchorage (UAA) and Alaska Pacific University. . . and Charter College completes the diversity of offerings. The sports scene at this time of year focuses on skiing, and Anchorage has Mt. Alyeska Resort, which is one of the best anywhere, and only an hour's drive away. Boston offers trains to Conway, N.H. and other ski resorts in N.H. and Vermont. The cost is prohibitive and unlikely that most can afford such luxury, whereas in Anchorage/Alyeska, ski bums have it good, with a hostel nearby the mountain, and reasonable prices for lift tickets and food. I guess you can say I'm hooked on Alaska, for so many reasons. We even have our own history, altho' different from the elitists of New England. What can compare to the gold miners, and early settlers in Matanuska Valley. They have a story to tell, and it is just as colorful, in a different way. So I guess the bottom line is that Alaska is a great place to visit, and even greater to live here. Come and see for yourself. It just happened a minute ago. I went downtown Saturday morning to help decorate tables for our Harvest Dinner tomorrow. . . then was dragging home (actually a 2 mile drive) down a main couplet when big ole mama moose and her darling yearling (also big) decided to cross the road right in front of me. Lucky I was alert enough to slam on my brakes and watch their nimble steps across C Street. I didn't have time to get my cell phone out for a picture, but thought I'd post this old one anyhow to give you an idea of their size. A friend of mine hit one a few years ago and it totaled his car. 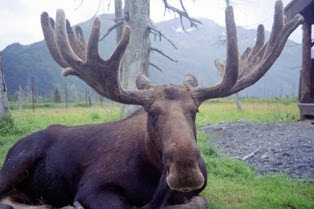 Also he was reprimanded by Forest Service, and had to fill out forms to show it wasn't his fault that the moose ran out from the woods into his car. Yes, they have right of way, as do bears and other wildlife. I don't remember any November in the past 43 years since I came, that didn't have snow. We're having a long autumn season, and it's all right with me. There are so many events going on, it's just hard to keep up. The First Friday Art Walk is always pretty special, and this month the Museum of Art and History is featuring a friend from Fairbanks, Sandy Gillespie. We have a huge new addition built on the west side of the original museum, that is quite overwhelming. It was designed by some famous architects in U.K., named Chittendon, or something like that. Well, if this were a proper blog, I'd look it up, but I'm just chatting here. In addition to this, this weekend's events include (but are not limited to) a Book Sale at the Library, Silver Tea at the American Legion, Gift Bazaar at the new Dena'ina Center, installation of new pastor at our church, Heritage Center Dances, and more. On the sports scene, the football season at the high schools is winding down now, but the indoor programs at the schools are in full swing -- wrestling, volleyball, basketball, gymnastics, etc. Sunday morning and evening has the NFL games in many bars, and clubs, and since Alaska timeis 4 hours earlier than East Coast time, it's easy to stay awake until the end of the game. So, let me again tell you that Alaska is a great place to visit year round. Don't think that because you entered on a cruise ship and left the next day that you're seen Alaska. There's much more. One of the best tours I ever took was an extension of an Alaska cruise that took us to Fairbanks, Chicken, Eagle, Dawson, Whitehorse, Skagway and Juneau. . . and don't forget to buy travel insurance when you come here, there, and everywhere. See my webpage for info and app! 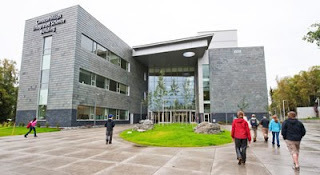 This is the newest building at the University of Alaska Anchorage, compliments of ConocoPhillips, and formally named the Integrated Science Building (CPISB). Recently opened this fall, it is eco-friendly, with State-of-the-Art construction, dedicated to similar instruction, research, and interdisciplinary science. The public was invited to the opening program, and were overwhelmed by this 120,000-square-foot facility. In addition to the three modules, or wings, adjacent to the glass atrium is a 64-seat digital planetarium, with a 33 foot dome that projects a seamless image over the entire dome surface, with a sound system to match. ConocoPhillips Alaska, Inc. pledged $15 million to support science and engineering programs at UAA, and it was named in honor of the generous oil company. Over the years, the University has become a real showpiece. My blog a few months ago talks about the Foucault Pendulum at the beautiful new library, which is the closest building to this science building, and the arts building houses three theatres that have a vibrant arts season. I don't know what's coming next, but each new building is exciting to visit for the public, and inspirational to the student. Anchorage is hosting the annual Federation of Natives Convention this week, headquartered at the Dena'ina* Convention Center. These beautiful ladies, pictured above are Alissa Joseph of Delta, and Alice Oksoktaruk, from McGrath. 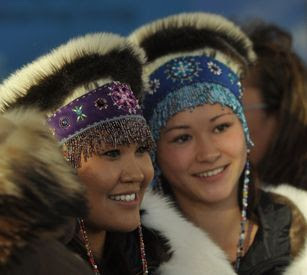 They are wearing Parkas and headpieces, handcrafted by natives. These skills have been passed down thru the years, and during the year, it is a treat to visit the Native Hospital and browse thru their gift shop. The Anchorage Museum of History and Art also has a fine collection, but of course, they are not for sale. For the readers who are interested in native culture, goto ADN news. I also suggest googling Alaska Natives, as I would do as, I am not privy to their meetings either. I will add they are a boon to the municipality's economy, too. *Footnote: the pronounciation of Dena'ina appears to be "Deena-eena", which I love the sound of, but it's wrong! Correctly, you would say "Dee-9-a" . . . this is beautiful convention center about 2 years old now, that most of us voted against, but now that it's here, we are happy to have it, and have changed our vote. It has made the downtown area user friendly, as they have also put in heated sidewalks to connect it with the Center for Performing Arts. A new parking garage, and lot helps, too, so locals are encouraged to go downtown again. I just had to include another image taken from our local paper, the Anchorage Daily News, as this whale hunt shows the real Alaska, and part of the subsistance of the natives. It's not winter yet. . . in fact, it remains more like summer here, as it's still warm and sunny in Anchorage, which is most unusual. . . especially, watching weather reports on the lower states that show early snowfall in several states. The city visitors include the bears, out of hibernation, moose, and other smaller critter. My friend took this shot, and the subjects never even noticed! Indoor sports have filled the calendar, with football games on TV more than Monday Night football, and we just had our annual fall cribbage tournament. I did finish respectably this year, but it's a long way to the top. Ah, but you don't want to hear news of my personal life, so I look to events to attract the tourist. We have a very active theatre season. The main series are offered by the Anchorage Concert Association, the Anchorage Symphony, and the Anchorage Opera. There are a multitude of local productions by the Out North Theatre, Anchorage Community Theatre, Alaska Dance Company (their recital is called Mobius), Alaska Magic Circle, and more. . . fairs and shows are almost weekly at the Sullivan Arena, and now, at the new Dean'ina Center, and these include the Sports Show, Women's Show, Made in Alaska Show, Holiday Bazaar, etc. The University of Alaska Anchorage also has a full schedule of sports teams (everything but football) and the schools have a full program that does include football. There's much more going on that what I'm writing here, and I'll review our sports programs in a coming blog. You just have to view our Coastal Trail to see the popularity of running, walking, etc. and the destination 15 miles south if often Kinkaid Park, which was a former homestead just south of the airport, and right on the Inlet. It's a great site, and attracts national athletes to races year round. This is a great place to visit, and I'm sorry that so many visitors arrive from their cruises, fishing lodges, etc., and leave the city of Anchorage the next day. The most visible event in Anchorage this month has been The Lion King. It is a super big production, and received only good reviews. Autumn has taken over the summer scene, and termination dust has creeped down the mountain range to the east of town. (For newbies, this means snow) Golf season, fishing, etc. have given way to hunting, football (both High School and our Wild semi-pro team), and soccer. This year we have The Dome so the schools rent space for their sports activities. Through the years, we have added most franchises from the lower states, ie. Walgreens, Target, Kohl's, TGIFridays, Golden Corral, Appleby's, Outback, etc. and some of us are anxious for the Olive Garden to come. But for the most part, we have just about everything we want and downtown Anchorage is more accessible than most cities' downtowns. 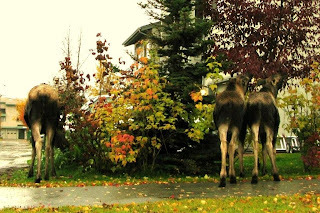 So Anchorage is still a good place to visit, even in the fall, and all of Alaska extends greetings to our visitors. I had planned on writing about our State Fair, but somehow just never got around to it. .. it was unique in that the long daylight hours and more sunshine than ever produced some record breaking vegetables. I think both cabbage and pumpkins broke the world record in their size. I attended a "Fungus Fair" in Girdwood last week, also, and some of the mountain men brought in wild mushrooms, which were about 15" in circumference, and about a foot high, too. I didn't eat any of these, as I guess they passed the tasty size, but did enjoy other treats and the live band playing in a large tent set up outside the courtyard of the beautiful Alyeska Prince Hotel. Among the many friends who visited at our table was the doctor, who inserted my new knees. The funny part of this is that I called, "Hey, Tim" to him when he was passing, and I would never even dream of calling "MY" doctor by his first name, especially since he's half my age, too! But the funny coincidence is that the girl we were visiting is his accountant, and she's a looker, so he was happy to visit with us. We did stayed overnight at her lovely home, and returned to Anchorage Sunday morning in time for church. Now if you view the mountain range east of Anchorage, you will see 'termination dust' each morning, and it won't be long until "it" reaches town. Yes, this means snow. The colors of fall are just beautiful, and summer activities have been replaced by club meetings, concert series, opera, etc. My freezer is full of silver salmon, summer fruit and berries, and we will survive the long winter with pot lucks at the American Legion, Pioneers of Alaska, etc. The Petroleum Club has started their Sunday football breakfasts and Monday night football, so here we go!!! 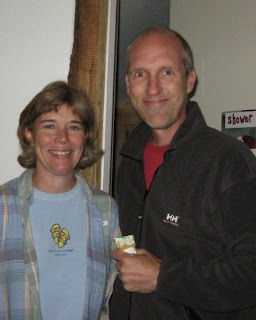 Alaska now has two members of Hostelling International. The downtown Anchorage one has been open two years, and just this past week, there was an official opening at the Girdwood Hostel in Old Girdwood. This is the village localed 40 miles south of Anchorage, and butts the great ski slopes of Mt. Alyeska. It was billed as an 'ice cream social', as you can tell from the pictures here, taken by our board member, Patty, who loves snapping candid shots. Any time is a good time to visit, but I prefer right now, as our summers are just beautiful, and this year was one of the best. The State Fair has started, so check back to my blog and I'll send some shots of it, plus some trivia. Our beautiful summer weather has been interrupted with showers, but the sun usually wins out by evening, and we continue to enjoy this exception year. I had to share this great shot of an eagle someone - unnamed - sent to our local paper. 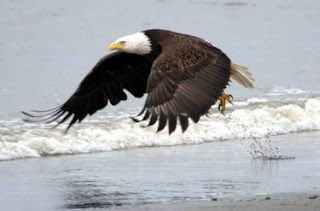 We do see eagles in downtown Anchorage as well as their nests in the many parks around, but outside of Anchorage remains the best place to view wildlife. Just a few miles at the south end of town, there is a viewing platform in Rabbit Creek area, and it's a good stopping point for visitors. My grandaughter is visiting and she went horseback riding Sunday with a good friend. I didn't realize we have so many horse stables around the city. I only knew of one by our zoo, and another within a miles of that, so this was a new experience for me to see these stables right by many trails, and the popularity of riding remains in Anchorage. Yes, even in the winter months. The town is abuzz with the State Fair coming to Palmer next week. This is about a half hour's drive from Anchorage, and draws lots of visitors every year. The fruit and vegetables of that area were for sale at the Anchorage Saturday Market, but the market has been taken over by food and souvenir booths, so the veggie markets have moved to other locations around town. The big cabbages and award winners are seen at the State Fair, tho'. The baseball season ends today for Anchorage Bucs and the other 5 teams in the Alaska Baseball League. We didn't win, but had a good season, weatherwise and attendance-wise. Now, we can look forward to the rains, because that happens around here in August! Friends visiting from Texas flew out to King Salmon, and loved it all, but it was all catch-and-release. My Texan friend refers to this as the same they do to prisoners. However, they did not return empty handed, because they visited the 10th and M lockers and bought fish to take home. . . consider the cost was like $100/lb. or more. 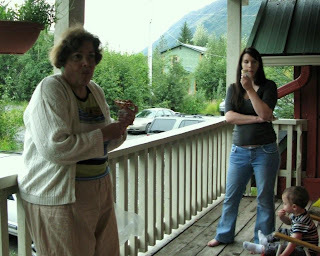 But all the visitors who come to Alaska seem awed by the different lifestyle, and surroundings. We took a trip on the tram at Mt. Alyeska, which was very impressive, together with the beautiful 40-mile drive to get there, and back. Seems the big question that tourists ask when they arrive is, "Where's Sarah?" . . . well, she's around, and in fact gave a speech last night to the local NRA group. She's a sharpshooter all right, and pretty visible around town, even tho' she's not the governor any longer. First Fridays each month bring out the art lovers, who can tour the many galleries around town. Also the museum hosts a great jazz trio, which used to play there weekly. The American Legion had a great barbecue, complimentary one! Golf tournaments abound, and it's a great money raiser for the npo's. Yes, lots of action around Anchorage, so plan your visit as soon as possible. This is a summer to remember for sure. The weather has been perfect. Activities abound, and my personal recovery from double knee replacement is almost complete. However, I read in local news that the tourist business is down, and those that are here are spending less. Downtown appears to be pretty crowded with these tourists, and all the restaurants have waiting only during the dinner hour, so who's to really know the stats. The baseball season is half over, and the Anchorage Bucs, my team, is near the to of the Alaska Baseball League. Today is Bastille Day, and the traditional show at Jens Restaurant is sure to draw a crowd as always. The big Petroleum Club golf tournament finishes the week . . . the field draws over 400 golfers, and their charity remains the First Tee Program. . . there's always plenty of partying as the club hosts the players, volunteers and guests to a steak dinner under a triple tent on the grounds behind the club, and dancing indoors. Anchorage knows how to throw a party, and this could be called party week by me, anyhow, as I'm going to test my new knees and try to get to all of the above. 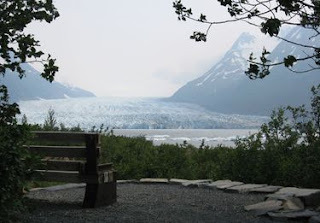 Those who chose to leave the big city often head to Spencer Glacier, which is accessible by train only. It's a beautiful place, and rafting and kayaking are popular there. This is midway between Anchorage and Seward, and the route is much more beautiful than the drive, altho' I will say the road has been improved and you can reach Seward (from Anchorage) in two hours now. Plan your trip to visit us soon! This is the Fourth of July, so the apt title. My blogs have been minimal this month since I'm recovering from double knee surgery, and no one wants to hear about 'pain' . .. in fact, every time I mention it, the reply is, "Well, you elected to do it" and I'm suffering in silence. The bright side is that my neighbor/caregiver/friend has brightened my condo, deck, and rooftop patio with flowers galore and the image above is one of the "Salmon on Parade" from downtown. You see, each summer Anchorage displays like salmon with themes around the downtown area so the tourists, and locals too, can follow the map to see them displayed, and at the end of the summer there's a big charity auction to spread them around. This is just one of the joys of walking around downtown Anchorage, as they have music concerts, fairs, markets, and constant activity. The restaurants are abundant, and they're all crowded, it seems. I have my favorites, but you can't go wrong just walking into one blindfolded. The 'downtown' salmon fishing in Ship Creek just ended, but they pulled some big ones out of there, and it's faster, easier, cheaper than traveling to the many lodges scattered throughout the state. This is also the time for baseball and tonight's fireworks follow the double header between the two local teams, the Anchorage Bucs and the Glacier Pilots. So come on down and visit us. Although it's not officially summer, this is it. The weather has been so beautiful of late, and it's particularly enjoyed as the writer is recovering from double knee transplant surgery. Walking up and down the halls of my condo in the sunshine is a sure cure for any aches and pains left . .. and believe me, I had plenty. Now I feel mostly recovered and glad to have it over. The tourists abound, even tho' the numbers are down. Fishing is so good, they're raised the limits on your catch most places. The two local baseball teams, the Anchorage Bucs and Glacier Pilots, are at it again, with the 4 other teams of the Alaska Baseball League, and the visiting players are strong. This is a great time to visit the great state, so come on down! 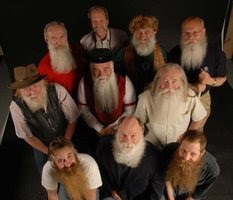 Anchorage is hosting the international beard contest tomorrow, and all around town today there are these bearded guys from the whole world struttin' around. I went to the Chamber of Commerce Business Exchange, and they gave us all $20 tickets, so I guess I'll go, altho' the Pioneers are really working all weekend, getting the Downtown Cemetery ready for Monday's ceremony. Of course, there will be the usual trail out of town, but there is plenty to do here. The American Legion is having their anual bar-be-cue, and there is a half-marathon run coming up, too. Addendum: These characters have been parading around town, and it's such fun to watch them in their 'costumes', which adds interest to the beards and moustaches. I liked Robert E. Lee best, as I get nostalgic to my Texas days. I'll try to find a shot of him, to post here. Guess I could even get out my Nikkon Cool Pix and snap a shot myself . . . The weather has been so beautiful the past weeks, that I'm reminded why I live here. Plan your next holiday in the great state, and you'll see what I mean. .. . . The tourists are arriving, and they are lucky to share the beautiful weather we've been having . .. while the Florida folk are seeking cooler spaces, we Alaskans are enjoying beautiful sunny, windless days, and it's perfect for outdoor exercise, and everything else. The downtown market opened last week, and it was pretty crowded, as it will be thru September. The potholes caused by the fierce winter weather are being repaired 24-7, and the down side is that so many streets are closed for repairs, too. That's pretty minor compared to views such as the image above, which was taken by a local fellow, which you can see exactly from downtown. Mt. 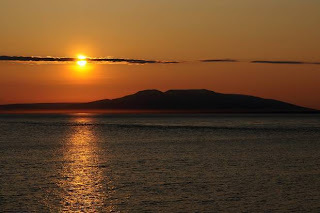 Susitna is nicknamed "Sleeping Lady" and a well known view west of Anchorage. Hard to improve on sitting in a downtown restaurant at dusk, viewing such sights. We have so many events this week that I can only mention a few. The Anchorage Convention and Visitors Bureau is hosting a "Business Exchange" at the Wild Berry Farm, which is always a highlight of the season. Complimentary food, drink, entertainment, promotions. To describe this place, it's a short drive (or complimentary bus ride) from downtown, and the campus includes the Sourdough Mining Company (great ribs), Gen'l Store (great British licorice), outdoor patio, theatre, reindeer viewing, etc. Okay, I'll admit I'm cutting this short as my flowers are calling me for some attention . .. I'll be attaching some our the great flowers bloomin' around here soon. So check back! Just when you think you can't take any more winter, spring arrives. Seems like overnight, we're planting our flowers, going outside without coats . ... well, you know, it happens every spring. One of the first signs of spring is the culmination of the raffle for the Nenana Ice Classic. It's a silly old tradition that you guess the time of the right day that the stake in the ice at Nenana will fall over. The pot is around $300,000, and I was counting on it to go out this week, as I bought several tickets for myself and friends, but it fooled me, and fell on Friday night. So, the next sign is the arrival of birds in my bird feeder. Maybe they've been hibernating with the bears. Next, comes clean-up. City-wide, groups, clubs, and singles have been filling large orange plastic bags with trash. Our church had the big clean-up on Saturday, and 'they' did a great job. I mean, without me. Guilt was written all over my face when I went to services on Sunday, but I had a good excuse, which we won't go into. Alaska puts little feelers out around the world, and this week, we witnessed an Alaska son become an overnight hero at the Kentucky Derby. Local business man (and therein lies a long story), Bill Allen, has a son in New Mexico, who drove his horse to the races, and was a 50 to 1 bet. It wasn't long until everyone knew Mine That Bird and his rags to riches story. Hurray for him. Let's have another Mint Julep on that one. Speaking of Mint Juleps, do you realize that Cinque de Mayo is on the cusp, and there are enough celebrations going on without this, but let's just add this to our list. The Petroleum Club is recognizing this independence day, and the Pioneers of Alaska have an unusual party, as the men are supplying the food and drink after the regular business meeting. So that's where we're at, right now, with a long, social list set for May. However, there is a down side to all of this. One is the announcement of the discontinuance of Norwegian Cruise Lines coming this year, and the cutting back, sizeably, of Carnival, Holland-America, Celebrity, etc. cruises. . . this could be the downturn of the economy, but more likely our State Legislature imposing a $50/head tax on all cruisers. This is going to hurt the businesses in Southeastern especially. One last word . .. following up my travel insurance pitch, I want to report that my friend was reimbursed for the expense of hotel and other for the delayed flight last month en route from Anchorage to Portland. It's worth the extra buck to be covered when you travel because more things are happening than in the simple days of the past. Swine Flu Has Not Reached Alaska! I hear from some of my faithful followers that they're tired of reading about our volcano, Mt. Redoubt. I don't blame them. Now the big scare is this swine flu starting from Mexico City, but it's not here. Don't forget to get travel insurance, especially if you leave country! We have only beautiful springtime days and it's so great to go outdoors coatless. I'd post some pictures of flowers, but it's a little early, so you'll have to visualize some of Georgia O'Keefe's great art. We have our fair share of artists here, too, and one of the best (watercolor and sumi-e) is my magic partner. The Anchorage Museum of History and Art is being renovated, and a multi-million dollar extension promises to make it a visitor's destination when it reopens late May. Until then, the first Friday Art Walk continues to draw art lovers, and wine sippers, too. The bike trails continue to grow, and as the bears come out of their hibernation, we read daily about encounters with bikers and runners. Another of our year-round attractions is Kinkaid Park, which is a huge 40 (?) acres park with cross-country ski trails, a popular chalet, etc. It's just south of the Anchorage International Airport as the crow flies, but a longer drive to reach it. The bike trail goes from Kinkaid Park all the way to downtown, and it skirts the inlet, Earthquake Park, Turnagain Subdivision, and Westchester Lagoon. Pull out your GPS or Mapquest, and you can enjoy viewing from above. As April fades away, I'm trying to post my Midi version of "I'll Remember April" but I have to figure out how to get my piano hooked up again. Lots of visualizing needed on this blog, eh? Well, after you picture the flowers, picture the music. Til then . .. cheers. Moose are all over the place this time of year. They come into Anchorage to feast off of the trees, growth, and anything else happens to be within reach. However, you can enjoy seeing them from a distance, but not so great when they come out on your route home. I just avoided a cow moose with her newborn recently driving home in the evening. Now, I only live 2 miles from downtown, and you would not expect to see them on a main road . . . but I would. I've had friends who have hit a moose with their cars, and it's totalled in most cases. Aren't you glad I'm not talking about the volcano anymore. I've had enough of it, too, but I am thankful in a way that it had helped promote my travel insurance business. I won't go into the horror stories any more, but you know there are many more reasons to take out insurance for your forthcoming trips. See why! Anchorage is bustling with trade shows, promotions at the new Dena'ina Center and the Performing Arts Center with it's three theatres filled most evenings. Right now, Spamalot is playing with John Hurley in person, and a good review in the local skinny newspaper helped promote this already popular attraction. On a personal note, the Godmothers of Magic are performing a magic show, today, in fact! Add to this the attendance at funerals and wakes keeps the locals pretty busy. We did lose a giant in the news writing line this week, and Bill Tobin's popularity with all will be sorely missed. He was also a 'closet magician' . . . my term for those who dabble in illusions. 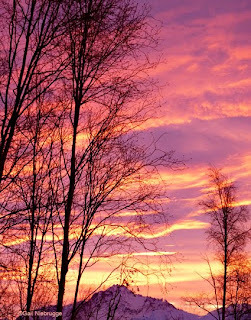 Breakup is not the prettiest time of year in Alaska, but soon we'll have beautiful gardens again. I promise to post some of the best ones. So check back. Looking over my recent blogs, I realize I never shared this image above . . . quite out of date, but it's so beautiful I had to share it with the reader. 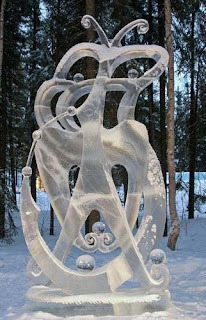 It was sculpted in Fairbanks, not Anchorage, but I have to give them credit for their challenges. If you saw my last blog were posted, you would know that I recently returned from a trip to Oregon and California. It's springtime down there in reality, and here in Alaska, it's just on the calendar. The hardest time of the year here, as the snow is all dirty, and the eruption of Mt. Redoubt hasn't helped a bit. It's like dirt and soot all over your car, lawn, flowers (joke) . . well, I'm exaggerating, because it's still winter, and breakup is a messy time. However, we have plenty of indoor sports in Anchorage, and a fairly new addition to the city is "The Dome" which is a bubble the size of two plus football fields. It's been a boon for the school's sports programs, as they can start practicing track and field early. So I'll sign off here check my other blog . . . I know Google would not like for me to tell you that wordpress dot com has my other blog and they have a few advantages . . . my name there is alaskab4udie. My next blog I'm going to write up some stories about the travel insurance I'm selling now and how it hasn't covered volcanos. It was a lesson in futility, but it's still wise to take it out. You never know. I ran into a girlfriend, Pam, who was returning to Anchorage from N.J. and was stranded in Seattle four nights, waiting for flights to resume. She couldn't even get her checked bag, so had to buy the usual necessary things, all at her own expense. Don't you know she would have benefited from having insurance. Why not buy, just in case. The title refers to our return, but still encouraging your visit. That is, assuming you're reading this from afar. We did return last night, and it's always good to be home. It was an 'iffy' takeoff when we left last week, as most flights were cancelled due to the continuing eruptions of Mt. Redoubt. However, we were lucky as our pilot announced we had to go right away as another eruption was starting, and we were the only flight that day to make it. Since we were going to a meeting in Portland, Oregon, we had to make a connection from Seattle. We didn't. So one hotel room and a three hour drive later, we did arrive in time for our two day meeting. Portland is a very beautiful city, but our free time was limited to a drive around town, lunch at the famous Kennedy School, and two nights in Lake Oswego. A great visit, nonetheless. Next came our flight to Santa Barbara. This sounds easy enough, but we did it the long way, as we had to return the car to Seattle and then fly south. When you deplane in SBO, you are left alone. No public transportation, and it's 60 miles to Santa Maria. Lucky for us that a friend picked us up, took us to her beautiful home, which was a menagerie of 6 cats, 2 cockatoos, 4 lizards, two huge fish, plus little guppies, etc. and any stray animal that should wander by. The garden was on three sides of the house that was a delightful combination of gazebos, brick walls, stone walks, bushes, trees, flowers, that had been carefully planned with an artful eye. She kindly loaned us her car for the trip further north. Still not at our destination, we drove up to San Luis Obispo, which is the site of Cal Polytechnic. This was another 30 miles, past farms, ranches, open country, and close to the coast on good highways. The college is huge, as are most, and we parked and went into the men's dorm to visit with my friend's son, a freshman there. The dorm was a typical assortment of beds, books, bookcases, one large piece of art, and 'stuff'. Since it was a holiday some places in California - Caesar Chavez Day - we were able to take off for Pismo Beach, which was crowded with students, in bikinis, even though it was chilly. We went to dinner with friend's in Cuyucos, just north of Morro Bay, and spent the night there in their lovely home overlooking the ocean. The couple fixed a beautiful dinner for us, and we left shortly after breakfast to return the college student to his early class, and continued into the town to visit some more friends in the courthouse, this time. After a short visit, and shopping, we returned to Santa Maria for the night, and flew home without any problems. It was a whirlwind trip, but always good to be home, and continue tracking our pet volcano. 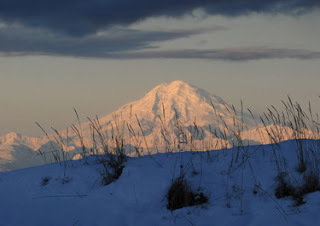 The next blog will be back on track with Alaska happenings, so check back. This is not some far off exotic location - it's right here in Alaska, just a hundred miles west of Homer. Altho' the image is quite beautiful, in Anchorage, we wait to see which direction the winds are blowing, and hope they continue to go north instead of east northeast. Those of us who were here the last time Mt. Redoubt erupted, remember the ash that covered the land, streets, and our cars . . .. you don't want to take a wet cloth to wipe your windshield, as it makes a gummy mess. It's just an unpleasant situation, and this year is good, so far. 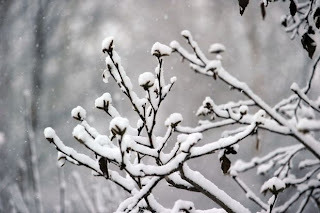 Besides that, we need to remind ourselves that this is spring, and the snow that continues to fall every few days is just an illusion. The stores are already selling seedlings, and have a good supply of outdoor plants, too ... so, I'm ready. In case you wonder how the Iditarod Races ended . . . it's all past history now, except that there are a few stragglers left on the trail, perhaps trying to get the red lantern. Over the past week, we've had several attention getters . . . the circus came to town for a few days, and there is a home and garden show on at the Sullivan Arena. This shoulder season is actually a good time to visit Anchorage, as it's not so crowded, and don't wait for the airlines to drop their prices. When you do make your reservations to come visit, remember that travel insurance is pretty important, and you can read WHY here. Attention this week is temporarily diverted to the annual Jazz Week. This is overlapping this year with St. Patrick's Day, and the finish of the Iditarod Race to Nome. However, the University of Alaska Music Department is sponsoring this as a showcase for their jazz program, and it includes several workshops, concerts, jam sessions, and networking for a special group of jazz lovers. We were visited last week by Ramsey Lewis, and then Taj Mahal trio played, so there's plenty downtown, in addition to the University Arts Building. So by the time I post again, I'll have some images for you, plus the finish of the great race. On my last blog, I mentioned the travel insurance I am presently licensed to sell, but you must not just cast the idea aside, as you may reflect on how you wished you had it. I will give you one personal example that sold me on it. A few years ago, I headed to Texas for a cruise out of Galveston. My luggage was lost (delayed?) along the way, so I had to leave the next day on this cruise. I never carry 'stuff' on the plane, so I had to buy makeup, toiletries, vitamin pills, sneakers, few changes of summer clothing, etc. I put in a claim, and was reimbursed without hasstle. I did get my suitcase the next week when I returned, but not in time for use on the cruise. Another time, I was traveling back to Anchorage and I was sick. I just couldn't make the last leg of the trip, so I stayed over in a city en route, went to a doctor the next day, waited at girlfriend's home for 2 days, then completed my trip back, with penalties on the ticket. Travelguard paid for both the medical and the ticket. I have more stories, but check out my 'reasons to buy' page. Like most pages, filling it out may be a bummer for you, so email me, and I'll fill it out for you. Yes, they're still on the trail, and the leader changes daily, but there seems to be a big lead now by Lance Mackey. There are so many hero/horror stories that can be told on this long . . . 1024 mile . .. trip to Front Street in Nome, and many tears will be shed. Tears of joy are preferable. Have you taken a trip where things didn't go as planned, . . . disappointments, missed flights, lost baggage, medical needs out of the U.S. where your insurance just doesn't cover you? My blog is going just a little bit commercial, but I do suggest you take out travel insurance when you buy your tickets. It will pay you to read a bit about it first, then sign up online. That's how come I got my license for a product I use whenever I travel. . . even roadtrips. Think about it. 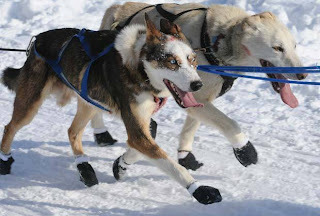 And in the meantime, keep cheering your favorite dog-team on to Nome. I'll get off this kick soon. You either love these races or you don't. 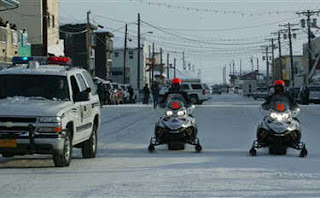 But the race will end in Nome in a few more days, and I'll get back to my talk about the happenings in Anchorage. I hope the reader will enjoy he same things I do, as I post some of them. The weather here is finally approaching springtime weather, and the sun's been shining every day. This might mean that the snow is over with.. . maybe. When it does warm up a bit, the Nenana Ice Classic will end. If you don't know what that is, well, it's a raffle to guess the exact minute the post in the ice at Nenana will tip over. If there's just one winner, you could be looking at a pot of several hundred thousand dollars. At least, you can be sure the 'feds' are watching, as it is taxable. Ahem! I wouldn't mind paying the tax on winnings, so I'll just sit tight and wait on that one.. . 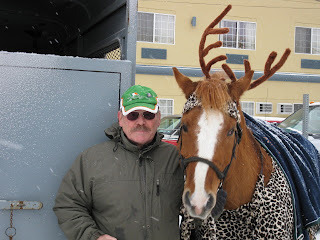 The parade was a good one, and I just have to share some cute photos of my friend's horse, decorated with antlers like a moose. They wore costumes, and filled in for the lack of marching bands. In this weather, your lips would stick to the mouthpiece of a trumpet and it would be difficult to perform your best. It was pretty cold on the horses, too, but they're tough. The King and Queen Regent are attending everything, and have such stamina to do it all. I wanted to post their picture, too, but haven't received one yet. Our local paper totally ignores them, but they are a pretty special couple chosen each year from the Pioneers of Alaska. Today, they appeared at the funny hat lunch. I misunderstood, and thought it was an 'edible' hat lunch, but that was just one of several categories. Since I was the only one with an edible hat, I won a blue ribbon for that. But there were many fancy and comical hats there, too. Check back here in a few days for my sparse coverage of the Iditarod Ceremonial Start of the Dogsled race to Nome . . about 1100 miles of rough going. By the way, I want to mention that I'm now selling travel insurance. I have used one company with such success on travel mishaps, that I want to share this product with you. It'll be available online, so you don't really have to come to Alaska to get it, but it would be great for you to include Alaska in your future! This is a pretty cool Rondy this year. The weather cooperated, and the snow fell gently for the parade. I don't have pictures of that, but I need to get one of my good friend on her horse, soon. .. not too many bands because the instruments do freeze up. 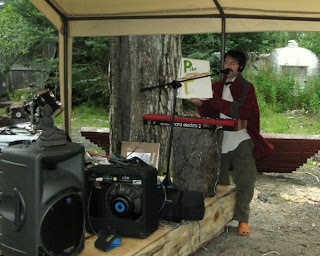 I was unable to actually attend, altho' I was very closeby at the Pioneer Hall, where the Pioneers of Alaska traditionally serve a full, hot breakfast for a minimal cost. Saturday, we served over 800! Sunday not so many. The dogsled races run for 3 days, and in addition to this there is a snow sculpture competition near the railroad depot. 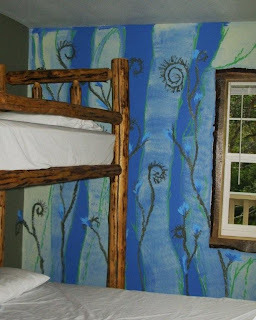 The usual arts and crafts continue thruout, and dogsled rides are available on the parkstrip. 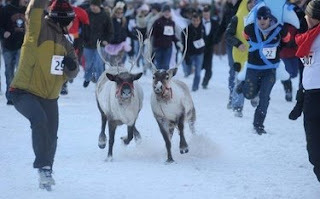 I don't have any pictures of these, but hope you enjoy the picture of the running of the reindeer. Someone got the great idea from Pampalona, but we don't have any bulls here, just other wildlife. This is a fairly new event, and really a kick in the pants. The Senior Center has a first-class party, where old-timers, and long-timers, tell tales of the real Alaska. They also host several contests, and today I played in the cribbage tournament. It went on forever, so I didn't wait for the finish, not that I was heading for a blue ribbon, or anything like that. But this is a fun week to be in Anchorage, and it will be topped off by the start of the Iditarod Races. In addition to doing travel consulting, I'm now writing travel insurance, which is a really good idea in these uncertain times. When you book your next trip, with whomever, think of me wanting to write up the insurance part. Rest easy knowing you're covered! 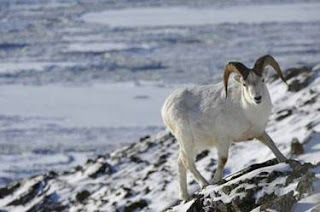 What could be prettier than these dall sheep you see while driving south out of Anchorage to the Alyeska Ski Resort, which is only 40 miles away, on good highway. I told you there would be a lot of winter activities in February, and I've been too busy to blog. How could that be! 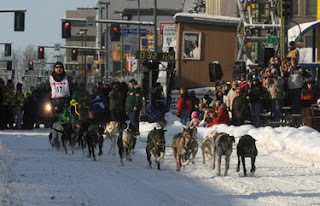 This image is the Iron Dog race start -- not exactly downtown Anchorage, but this weekend starts the big dogsled races which is right downtown on Fourth Avenue. 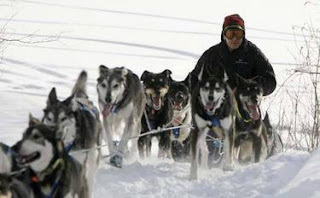 This is the longest running race around, but now competes with the big Iditarod Race, the Idabike, and the Yukon Quest. 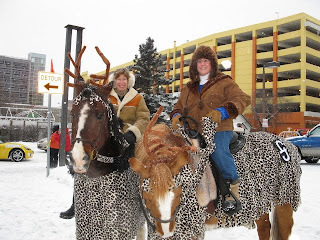 Fur Rendezvous is a festival of sorts which has changed over the years to a point where the actual fur auction was deleted, but now is back again this year . .. Monte Carlo night was one of my favorites too, but they haven't brought that back yet. . . however, there is a heap of displays, carnival rides, exhibits, dances and melodramas. The King and Queen Regent are chosen from the Pioneers of Alaska, together with Miss Fur Trapper. This year's chosen are Ray and Jean Lee, and the coronation is an elegant ceremony at Pioneer Hall. The Pioneers of Alaska have a weekend pancake breakfast, with continuing seating, which draws over a thousand people each year. I'll post some of the images when I get to steal some. I'll give credit if I can find such. Anyhow, we're waiting for YOU to visit. We go a little crazy up here with the long, cold winter, and this image shows one of the diversions the ladies thought up. 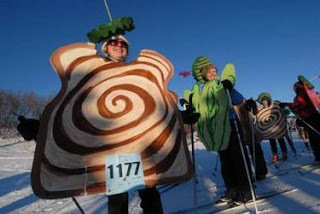 . . they picked a below zero day, and the same day as the Super Bowl, to dress up in costumes, and have a cross country ski rally. There were 1100 of them, but I wasn't one. Indoors, we had the Martha Graham dance troupe . . . and the opera's on this week, and a new play, The Ballad of Soapy Smith. 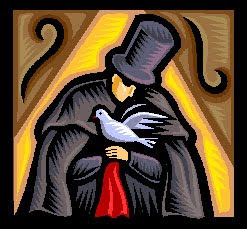 . . on a personal note, the Alaska Magic Circle puts on 4 performances on Valentine's day weekend, and I've chosen a 'romantic magic' theme for my part. All of these activities are leading up to the big Fur Rendezvous celebration, followed by the Iditarod Race to Nome. Speaking of that, on a political note, our nationally famous governor has proposed a road to Nome, which doesn't make much sense. One pundit refers it as the "Road to Nome-where". Keep posted! 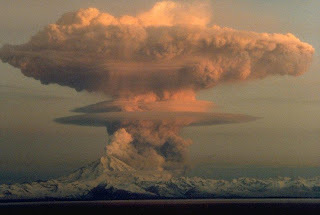 We have a beautiful volcano, located due west of Homer . . . and . . .. it's about to erupt. There's a watch on it now, and we're waiting for the spray of dust. You can see from this image how pretty Mt. Redoubt is . 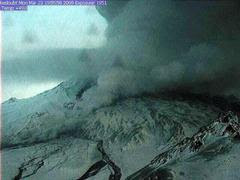 . . but the last time it erupted was about 12 yrs. ago, and it was unforgettable. The sticky gray film landed everywhere in Anchorage, and even stopped some of the flights from taking off, as this dust got caught up in the engines. Personally, my car had it over the windshield, and you didn't want to turn on your wipers, which would only smudge it. I promise to follow up on this upcoming problem, but if you want to read our very skinny newspaper, click here. Of course, you don't want to read about funerals here, but I did want to mention a rather special one that was held today. Maxine Reed was reaching a hundred, but didn't make it. Her husband, a real Pioneer, was holding her hand as they passed, and things won't be the same without her. 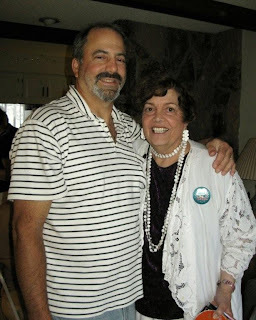 Her daughter eulogized, "She was the internet before the internet was invented" and that was aptly put. Bye, Maxine, see you later.